PhD in Health Policy. Dissertation topic: Use of Intranet and Other Interventions to Improve Influenza Vaccination Rates Among Health Care Workers. To play a key role in moving health care online in ways that will benefit patients and their families, while at the same time making the health care delivery system more efficient and less wasteful. 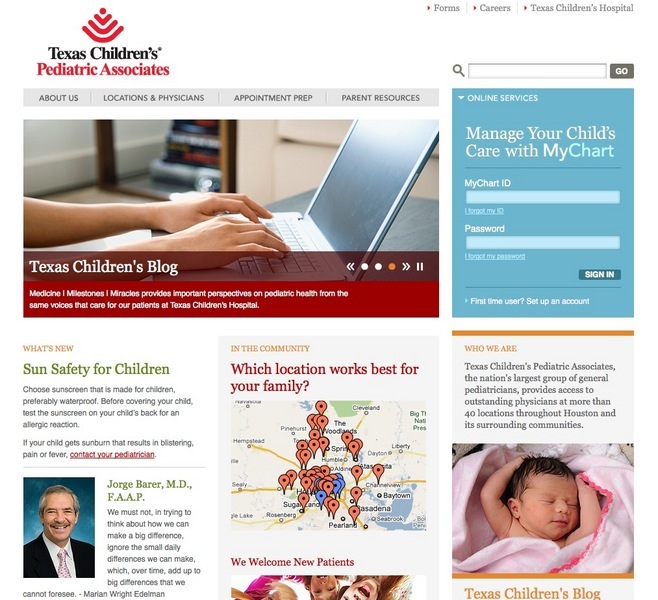 I have overall responsibility for creating and executing a relevant digital marketing and communications strategy for Texas Children’s Hospital, including using Web web-based assets to improve and align internal communications. This includes oversight of all Texas Children’s websites, guiding their design and implementation, daily operations, project management, and leadership and supervision of web team members. The scope of responsibilities also includes social media, e-marketing and online video. I also have responsibility for offline internal communications and publications. I interact regularly with hospital and service line leadership and key marketing colleagues regarding objectives and strategies and direct programs through close collaboration with Information Services and Creative Services. My ultimate goals are to create a superior on- and offline presence that fully engages all key constituencies, including physicians, staff, media, donors and patient families and enhances the overall reputation and image of Texas Children’s. Provided leadership for Texas Children’s digital marketing programs, including content, production, design, and functionality for multiple Web sites, plus development and assessment of internet marketing strategies, including social media. Interacted with hospital and service line leadership and key marketing colleagues regarding Internet and intranet objectives and strategies and managed programs through close collaboration with Information Services. Successfully launched new Web sites for Vision 2010 and the Neurological Research Institute. Developed social media policies for Texas Children's and executed online social media strategy, focusing on Facebook, Twitter and YouTube. Provided editorial and design vision and leadership for developing and maintaining St. Luke’s Episcopal Health System’s online strategy and web sites. Wrote, edited and distributed St. Luke’s monthly eNewsletter (circulation: 40,000). Coordinated requests for web support from departments and entities throughout St. Luke’s Episcopal Health System. Communicated to executive leadership projected costs and timelines for all web-related projects, and ensure efficient workflow by setting priorities within the department and monitoring performance of staff on weekly basis. Partnered with Episcopal Health Charities to launch interactive bilingual web site offering free health access information to Houston-area residents. Negotiated and managed contracts with outside vendors. Prepared and tracked departmental budget of $1 million. Assisted with media and public relations. Wrote, edited and evaluated all web content for St. Luke’s Episcopal Health System’s web sites. Represented Web Center at executive-level meetings to help set departmental priorities. Set design and content standards for St. Luke’s main web site. Promoted to Manager, Web Center. Represented St. Luke’s Episcopal Health System to local and national media, including speaking on the record and live on local radio programs. Wrote news releases and contributed articles to other Health System publications. Organized press briefings for local and national journalists. Contributed content to St. Luke’s web site. Drafted news releases and articles for other Health System publications. Coordinated interviews with St. Luke’s doctors and local and national journalists. Promoted to Media Relations Manager. Managed process of preparing FY2000 Budget for Clinton Administration, including the writing and editing of specific chapters. Wrote press releases and other correspondence designed to keep reporters and the public informed about OMB policies, decisions and actions. Represented communications office at key staff meetings. Organized policy briefings and news conferences for journalists and Congressional staff members. Composed news releases and fact sheets summarizing health policy reports. Led effort to update Foundation’s web site. Developed and wrote Health News Index, a public opinion survey of Americans’ attention to health stories in the news. Graduated from the Annenberg School for Communication. Author and editor of hundreds of web pages for the Kaiser Family Foundation, St. Luke's Episcopal Health System and Texas Children's Hospital, including health information, news releases, e-newsletter articles and descriptions of clinical care centers. Experience in selecting, implementing and using content management systems in Cold Fusion and .Net environments.